Our World In Data charts world living conditions from 1820 - 2015. Despite what you might think, things are generally looking up. Sensational pictures appear on page one, win contests — and can make careers. But these pictures may not be accurate, they can present a distorted worldview. Photographers – in search of glory – will doggedly seek out stale visual tropes and stereotypes long after events render them meaningless — or wrong. Much photography from Africa, for example, augers in on graphic cultural artifacts and tribal costumes while in fact Africa is changing rapidly; by 2100 the three largest cities in the world will be in Africa. Literacy is expanding in Africa at an astounding rate. Virtually every demographic map of Africa paints a different picture of the lives of people than most photographs show us. You can’t report on — or photograph — the world unless you have an accurate picture of the world. Surprisingly, mainstream news media are often not good at painting that accurate picture of understanding. From news we get every last tidbit of daily catastrophe and gossip, that’s what “news” does well. But reporting on important trends that unfold over years or decades? That’s what news does not do well. Climate change and global food production are two of those underreported or superficially reported stories. Most people still think the United States is the world’s largest food producer. It is not. So if you can’t rely on standard news sources to gauge the state of the world, where do you go? People who need to know these things, Bill Gates, for example, or Steven Pinker, author of Enlightenment Now, go to one source: Our World in Data. This rich online publication is a compendium of constantly updated research and data that uses charts and other visualizations to chronicle living conditions on Earth. All the big picture stuff is here: future population growth, eradication of diseases (smallpox, malaria, polio), maternal mortality, hunger and undernourishment, famines, yields in agriculture, income inequality, happiness and life satisfaction, child labor, financing healthcare, government corruption, and (of course) war and peace. By the way, war is declining, peace is gaining. Everything at Our World in Data is free to download and use, gift of historian and economist Max Roser and his team at Oxford University. For a quick sample take a look at: The short history of global living conditions and why it matters that we know. What does Roser mean by “living conditions?” Simple things, really, but powerful and important. World population in extreme poverty, for one, it’s been plummeting. Worldwide literacy? In 1800, only about 15% of people could read and write, now over 85% can. People living in democracies? Now more than 50% of world population and data show it’s on the rise. Education? By 2100 world population with post-secondary education, or schooling past high school, will dwarf the rest. This rise in education creates a huge storehouse of human capability. If we want to see a smarter world, it’s important to see that these upward trends in literacy and education continue. Understanding what has been going right in the world is as important as focusing on what has gone wrong — if not more so. Journalists and photographers who only chase one disaster after another, relying more on adrenaline than understanding and insight do us no favors. Depending on the approach that then New York Times writer Brian Stelter uncovered in 2008, “If the news is that important, it will find me,” will likely insure that as a journalist you will follow, not lead. Realistically, some big problems remain stubbornly unchanged — or are getting worse. Twenty five years I ago I photographed the Ogallala Aquifer story for National Geographic that documented the extreme drawdown of groundwater in the North American Great Plains. 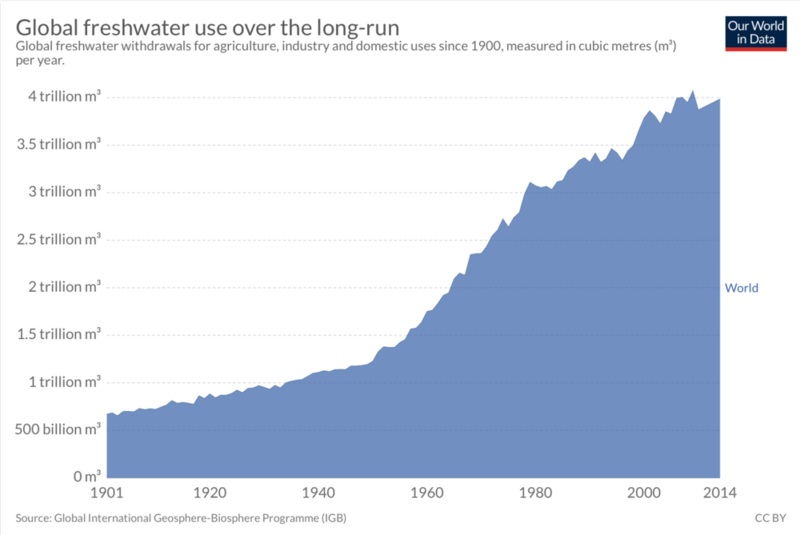 By exploring Our World in Data I found that global freshwater use has actually increased in the past quarter century. One reason: We pump fossil groundwater stored over millennia in aquifers like the Ogallala to irrigate corn to refine into ethanol for our cars. There is virtually no net gain in energy supply, or reduction in carbon emissions from ethanol. All we have achieved is diminish future water supplies. Of course covering disasters is one responsibility of the news, but the ultimate goal of a free press is not wall-to-wall coverage of disasters. The goal of journalism by my mind is an improved society. Information sources like Our World in Data can fundamentally change our perception of what’s happening in the world, and can produce smarter, more thoughtful journalism. Insights revealed by data at the global scale are essential for anyone trying to see and understand the Anthropocene, or Human Age, in its many manifestations. Photographers can benefit greatly from having a guide like Our World in Data, which can reveal big, important trends — and where to see them unfolding. George Steinmetz’s Feeding the Planet, a multi-year project to “photograph the challenge of meeting the rapidly expanding food demands of humanity,” is one example. Sources like Our World in Data can point the way to relevant locations where interesting pictures can be found. Journalists seeking fresh viewpoints benefit from having numbers to back up their observations and anecdotes. My picture of Denver’s glowing skyline (above) takes on an added dimension when paired with data on the dramatic rise in global energy consumption since about 1950. Microsoft founder Bill Gates is a key example of someone who lets data drive mission. Data led the Gates Foundation to focus on malaria in Africa — with spectacular results. Nine of ten malaria victims live in Africa, but relatively simple interventions (mosquito netting, for one) essentially cut malaria deaths in half between 2000 and 2015. Over time these disease declines can improve societies. Steven Pinker wrote Enlightenment Now, subtitling it The Case for Reason, Science, Humanism and Progress. Pinker drew heavily on Our World in Data and other sources like the work of the late Hans Rosling, who showed how declining population growth was tied to economic well-being. “This despite the fact that — on average — this would have been an accurate news headline every day during these 25 years,” says Roser. Having read that, can you ever photograph poverty in the same old way again? When I photographed Rhoda Mang’anya (above) preparing dinner in Malawi, I didn’t realize she was one of those people. Context is all when it comes to presenting photographs as facts. This can be a great story to show what coming out of poverty looks like, how this is happening — and more importantly — exploring what can work to lessen human inequality. And might I say, perhaps contest judges should be expected to factor in more than just graphic impact of an image when awarding prizes. Shouldn’t a picture’s ability to present an accurate worldview be just as important as a picture’s ability to give us an adrenaline rush? Maybe it’s time that contest judging panels be expanded to include jurors from other fields of study besides only those from the perpetual pool of other photojournalism professionals. If you are just trying to hash out some clickbait for tomorrow’s blog, don’t bother with all this truth and data stuff. But if you seek insights about our world that can help build a career covering environmental issues in these momentous times, then Our World in Data is a powerful resource.